Create a personal mandala as a symbol to live with, to study, and to begin a process of artistic development. Whatever your skill level, you will learn simple design, layout and acrylic painting techniques while you complete your own 20" mandala reflective of your inner world. A mandala this size will take approximately 20 hours to complete. Mutually convenient times will be arranged. The hourly charge is $15.00. Materials are an additional $25.00. Have you completed your first painting? Do you want to enjoy the comraderie of painting with others? Come to open studio on Tuesdays and Fridays (call first to confirm). Free - contributions appreciated depending on amount of instruction and supplies used. Bring food to share for lunch. A great introduction to mandala-making, for all ages. Learn the basics to start creating mandalas easily anywhere, anytime. This class is portable - I will come to your home or office . This class is also adaptable - everyone from children to business people can enjoy and benefit from creating mandalas. Good for team building and stimulating right-brain thinking. Length of class can be adjusted to fit your needs, and is usually 2-4 hours. (maximum $40 each, 4 hours)- minimum 4 people. Do you want to include an art project for a conference, a gathering of friends, or corporate team building? 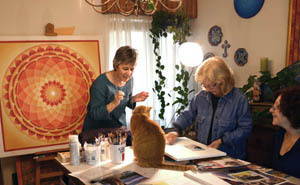 I will consult with you regarding theme and materials and lead your group in creating a mandala or other art project. 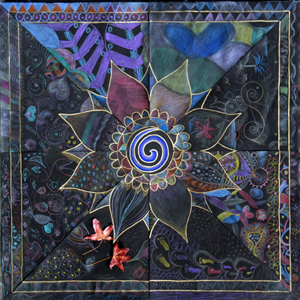 Collaborate and Celebrate - 75 women collaborated to make this mandala - with colored pencils on black paper. Click here for information on the November 15th Workshop. Email charlotte@mandalavisions.com to reserve your seat for these fun and creative class.